Hey guys! 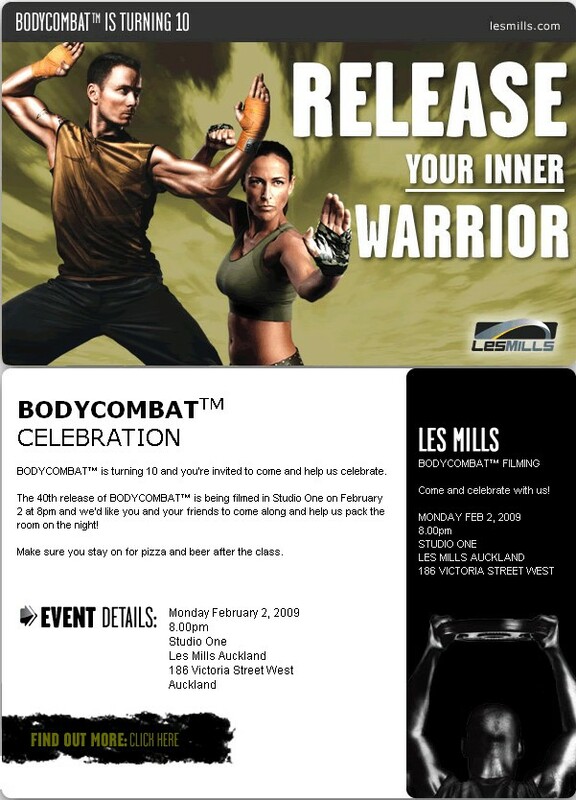 Just a brief update, the BODYCOMBAT 40 filming is this coming Monday (Feb 2) at 8pm at LM Auckland city (where else!). As I’ve already discussed it’s Combat’s 10th birthday so I expect to see a few changes in format, but I guess we’ll find out in a few days! As you may or may not know I live about 2 hours south of Auckland, so it’ll be a pretty late night for me – especially considering I’m teaching a class at 6am the next morning! Nevermind, no doubt I’ll be in post BODYCOMBAT-filming bliss and not be able to sleep anyway! I’ll post a full report and pics here on the Tuesday so stay tuned, and if you’re in Auckland and you see me do come say hi!! Well here it is! I haven’t had a chance to try this release as I couldn’t make the filming but workshop is early Feb so I’ll post my review as soon as I can… As for the music selection itself… let me know your thoughts! * Please note that I can’t guarantee the exact mixes are the same as the ones on the links (track 7 for example is a remix) – but you’ll get the general idea. Again special thanks to Andreas and Raina! Hey guys, just a quick update! In case you missed it the complete tracklisting for BODYCOMBAT 39 is now listed below along with links to each track on youtube so you can get a feel for them. Overall it’s looking like it will be a pretty good release! (If you haven’t already you can read my initial review impressions after the filming in November here). Let me know your thoughts! And, finally in some not quite so interesting news but still exciting (for me at least!) I’m all booked into do the BODYPUMP module in March! Was one of my 2009 goals so figured why wait! Should be a learning experience no doubt! Amazingly this blog is now getting over 1000 visitors per day so just goes to show the interest in the new releases, thanks for your support! That’s it for now, will get that BP69 list up as soon as I can and also (of course) details of the BODYCOMBAT 40 filming which is just around the corner! In the meantime really keen to hear your thoughts on the various releases’ music! Got a lot going in the coming weeks – the BODYCOMBAT 40 filming is just around the corner so will be very interesting to see if my theories there are close to the mark or not… plus the release of BODYCOMBAT 39 is just after that! And I’ve almost completed the track listing for BODYCOMBAT 39 so if you’re looking for that please check back soon! On another note it’s great to see the blog hit 50,000 visitors today… yay! Thanks for helping make this a formidable source of BC info online. You guys rock!